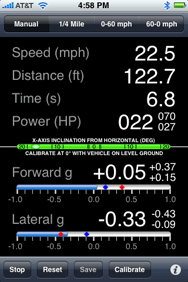 The iPhone 3G, with its accelerometers and GPS chip, has spawned a unique category of programs in the App Store: automobile performance measurement tools. These programs use the iPhone’s GPS chip to measure your vehicle’s acceleration and speed (and via this data, horsepower), and the accelerometers to measure the g-forces applied while turning and braking or accelerating. If you’re an auto enthusiast, the opportunity to measure these things using your iPhone and a relatively cheap piece of software is quite appealing—dedicated performance monitoring tools can be quite expensive. Since there are now quite a few programs in this niche, varying in both cost and feature sets, I set out to find the best of the best. At least, that was the intent heading in. Unfortunately, my request to rent Portland International Raceway for a week was summarily rejected by my bosses without discussion—it seemed perfectly logical to me, but alas, it was not to be. All kidding aside, this class of applications is really not something that can be safely or thoroughly tested on public roadways—many of them measure quarter-mile speed and time, for instance, and even the most pedestrian of vehicles will be well in excess of the posted speed limit at the end of the quarter-mile. Beyond the speed issues, though, there’s simply no safe way to evaluate all of these programs’ features on a public road. The other problem in evaluating these programs is that in order to judge their accuracy, I’d need a suite of test equipment similar to what you’ve find at Motor Trend or Car and Driver. Unfortunately, neither of those fine publications shares lab space with Macworld, so the best I’d be able to come up with is a stopwatch (while someone else was driving, obviously) to compare acceleration measurements—but only up to posted speed limits on deserted back roads. This would, however, leave the key features of many of the programs—G-force and horsepower figures—unconfirmed. Given these limitations, I felt it wasn’t fair to these programs to attempt to review them in a traditional manner—I lack both the track facility and the equipment needed to accurately gauge their performance. As such, I don’t feel it’d be fair to assign mouse ratings, because I can’t accurately test these programs. Instead, I thought I’d provide a brief overview of the programs that seemed to offer the most interesting and/or useful feature set—so that if you’re thinking of plunking down your money, you’ll have at least some sense of the programs that seem to stand out from the rest, and can use that information in making your purchase decision. The programs can be roughly grouped by what they do—there are a number of basic speedometers, some are only g-force meters, while the others are all-around performance measuring tools. I found five applications that provide basic speed information on 3G iPhones: Speed (free), How Fast (free), Speedometer (free), Speedometer ($2), and Speedster GPS ($1). This is the easiest category of application to test, too, because you can simply compare the speed readout on the iPhone with that of the car’s speedometer—with someone else doing the driving, obviously! As a general rule, what I found is that the variation in the GPS signal makes most of these programs unreliable as a basic speedometer. There were times with each program where the indicated speed would vary between 25mph and 55mph, even as my wife drove along at a constant 35mph. Stopping and accelerating also really throw the figures off, as it seems the GPS update cycle isn’t quick enough to keep up with the change in speed. Finally, anything that interrupts the GPS signal—such as heavy tree cover or a tunnel—means the end of your speed readout. With those considerations in mind, I had two favorites in this group: The $1 Speedster GPS and the $2 Speedometer. The actual speedometer in Speedster GPS wasn’t the most accurate, and it didn’t seem to continuously update the readout. It does, however, display longitude, latitude, accuracy range, and (most useful) elevation data. I found it interesting to see the elevation data, and comparing it readouts on our car’s navigation system, the elevation figures were quite accurate (rather, they were very close to the figures reported by the car). You also get a readout of the raw GPS data stream, and you can e-mail a log of these raw GPS values (or a log of your speed readings) to get them off the iPhone and into, for instance, Excel. For a pure speedometer, I found the $2 Speedometer program worked the best. You have to be moving somewhat quickly for it to start working—as is true with the other programs—but once it started reporting, it seemed to do the best job of tracking our car’s indicated speed, and didn’t suffer the same random jumps in the readout that I saw in other applications. You can view a traditional analog speedometer, or by rotating your iPhone to landscape mode, a large digital version. Speeds can be indicated in miles per hour, kilometers per hour, or knots. As cool as it might be to use one of these programs on a commercial flight, the reality is you can’t legally do that—when your iPhone is in airplane mode, the GPS chip is disabled, so you won’t get a readout. Those of you with your own Gulfstreams, though…feel free! I found them personally most useful while riding my bike, which lacks any sort of bike computer to display my speed. Although I wouldn’t get a reading at very slow speeds, above about 10mph or so, I’d usually get a relatively stable readout (assuming the iPhone could see the GPS satellites). These programs measure g-forces, both lateral and vertical, by looking at the readings from the accelerometers in the iPhone (or iPod touch). They also optionally display speed information, but those features will work best on GPS-equipped iPhone 3Gs. I found four programs in this group, all relatively inexpensive: AutoGs ($2), G FORCE ($3), GForce ($1), and G-Meter Lite ($1). None of these programs record the measured g-forces as they change over time; you simply get an instantaneous display in the form of a graph or other visual representation. A couple of them store your maximum recorded g-force values, but none offer the ability to move any of the g-force data off of the iPhone. Before you can use each program, you need to calibrate it, so that the program knows what “not moving, straight and level” looks like. This is easier in some programs than in others—AutoGs and G FORCE both do a form of auto-calibration (as long as your iPhone is basically level and pointed in the direction of travel), while G-Meter Lite has a calibration routine that allows you to orient your iPhone however you like, and GForce requires that your iPhone be positioned vertically in the vehicle. While these programs are interesting to look at, without the ability to export their data—and more than just the maximum-recorded peaks—they’re not really useful as anything beyond an admittedly very good demonstration of what’s possible with the iPhone’s acceleration sensors. This is the largest—and by far the most-complex to test—of the groupings, with six separate programs to consider: Dynolicious ($13), g-tac ($5), gMeter ($9), Rev Lite (free), Test Track ($3), and Track Day ($14). Each of these programs attempts to handle many different measurements of vehicle performance, covering everything from horsepower to g-forces to quarter-mile times to 0-to-60 acceleration time, and more. To get these measurements, as with the g-force applications, you must mount your iPhone in your vehicle in a secure manner, and oriented to your direction of travel. You then calibrate the program, and can then start using it. To secure the iPhone for my limited testing, I MacGyvered a mounting box using a chunk of styrofoam, duct tape, a chisel, and some removable double-sided mounting tape. All things considered, the end result worked quite well, holding my iPhone securely, and in a level attitude. It certainly won’t win any beauty contests, however. Using each program, once calibrated, is basically the same—they start measuring when you begin accelerating, so there are no buttons to push; just stop at a level spot on the track or drag strip, launch the program and allow it to calibrate itself, then accelerate. The programs here measure acceleration through various speeds and distances, and some will also measure g-forces from cornering and accelerating and/or braking. As noted right up front, however, I was unable to test any of these programs on a racetrack, nor can I make any statements as to their accuracy. With that said, I found Dynolicious, gMeter, and TrackDay to be the best of the bunch, based on what I was able to test in a safe manner with my co-driver. There’s also a skidpad function that will graphically track your g-forces from turning and acceleration and braking. Unfortunately, there’s no way to get this data off of the iPhone, nor can you enter current weather conditions to adjust the calculated results for temperature and air pressure. gMeter will track your times for 0-to-60 acceleration, 1/4 mile run, and 60-to-0 braking; an instantaneous readout also displays forward/back and lateral g-forces. A summary at the top of the window shows speed, distance, time, and horsepower, and you can save your runs. Saved runs can then be e-mailed out, though not selectively—every saved run is e-mailed each time you use the feature. Alone among my three favorites, gMeter allows you to enter in values for air pressure and temperature, which allows for more accurate power calculations. The main downside of gMeter is that you can’t store car information, so if you’re moving between vehicles, you’ll need to enter a bunch of vehicle data (weight, drivetrain loss, drag coefficient, etc.) each time you switch cars. If you just drive one car, however, this isn’t a problem, and gMeter seemed to work well in my limited testing. Like Dynolicious, TrackDay will display your acceleration runs in a graphical form (though also like Dynolicious, there’s no way to see this chart for a saved run). The program measures acceleration, reporting time to 40mph, 60mph, 100mph, and 150mph; each of these can be enabled or disabled in the program’s settings. It also measures performance over distances of 60 feet, 1/8th of a mile, 1,000 feet, and 1/4 of a mile (again, each can be disabled in the settings). You can enter multiple cars in TrackDay, and then track your results separately for each vehicle. What I really like is that the program uses the car’s make and model to find out the technical details itself—so values for weight, drag coefficient, frontal area, and squat angle are filled in automatically. I was impressed when it found figures for both my 1994 Toyota MR2 Turbo and our 2004 Honda Pilot. While you can save run data on a per-vehicle basis, you can’t export this data via e-mail or any other method. In addition to the acceleration data, you can display a real time chart of lateral g-forces, though this data isn’t saved with your runs, making it mostly a visual goodie. 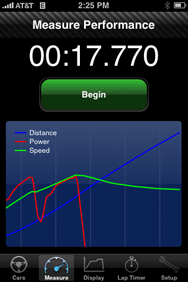 There’s also a lap timer that uses the iPhone’s GPS to automatically determine when you finish each lap. I tested this out by doing some “laps” at the posted 25mph speed limit around our neighborhood, letting the program determine when I had finished each lap. When I looked at the final results, I was impressed—the calculated times for each of four laps were within 2% of one another (on a roughly two minute “lap”), so TrackDay was obviously finding the “start/finish” line with a pretty good degree of accuracy. For this feature to work, you’ll need a 3G iPhone with the GPS chip. Lap times, however, cannot be stored or exported. The automobile performance measurement niche of the App Store is large, and growing daily, it seems. The combination of the iPhone’s GPS chip and acceleration sensors have allowed developers to create some fairly amazing looking programs—while testing these out, I had to keep reminding myself that I was doing all of this on a cell phone, and not a dedicated piece of automotive hardware. While I can’t prove the programs’ accuracy or reliability, hopefully I’ve given you a sense for what they’re all about. In the future, perhaps, we’ll see one of the automotive magazines do some real comparison testing between the iPhone’s tools and the professional performance measurement products. I know I’d certainly be interested in seeing how well a $199 cell phone and $10 software package do against dedicated gear that can cost hundreds or thousands of dollars.